This is the seventh year for the annual Strange Days event. A time for all of our Northeast chopper buds to get together for a weekend of camping, partying, and kicking back with pals. With a new venue, the Oakland Valley Speedway in Cuddebackville, NY, came the added attraction of flat track racing. Originally planned to begin on Friday night, the unpredictable weather postponed the race start until Saturday morning, giving the latecomers a chance to see more of the flat track action. Ken Buongiorno, event organizer and long-time motorcycle enthusiast, said that his original inspiration for Strange Days came from attending events like the ones put on by the Antique Motorcycle Club. Seeing other chopper shows develop and the lack of events on the East Coast (at the time) encouraged him to give this a shot. 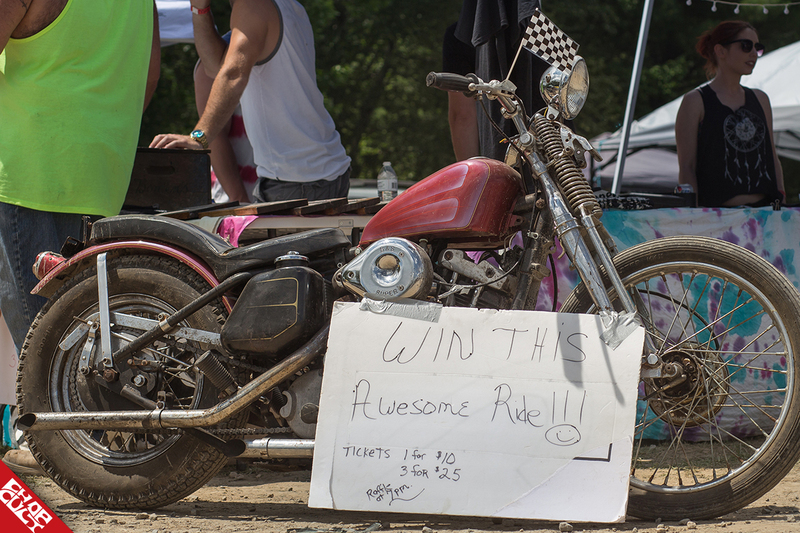 It started out as a small, ride-in party with live music, a few motorcycle awards, and giveaway prizes in the middle of a field. It has evolved into a rocking party with two days of live music, 12 bike awards, an increased amount of giveaways and a chance for one lucky attendee to ride off with a custom-built motorcycle, this year a survivor 1973 HD Sportster. Ken also organizes the popular Moto Jam events, which are focused on various types of vintage motorcycle racing. He had hosted a few events at the Speedway in the past, which is how he came across the new venue for Strange Days. Friendly owners and an excellent location made it an ideal place for the party. Ken explained that he digs the laid back, 60’s vibe of the weekend, a Woodstock feel but with added motorcycle madness. A good portion of that 60’s feel is from the artwork that appears on the promotional materials, thanks to mastermind Chris Dripchak. The laid-back vibe can be attributed to the people who attend, people that pull it all together and the far-out tunes playing all day. A favorite part of planning the event for Ken is seeing how the mere thoughts and conversations come together to form a groovy time. The most significant challenge is making sure everyone enjoys themselves. As you can imagine, another big challenge for Rush Cycles is arranging the build for the motorcycle raffle...always a high point of the weekend! Although the event has grown and evolved over the past seven years, Ken’s pretty content with where things stand right now. From day one, the goal was to get people together and have a good time. When I asked him about the possibility of doing a second Strange Days over the course of the year, possibly in the Spring, Ken said "Strange Days is such a far-out time; it might be illegal to have that much fun two times a year! We also do not want to take away from the Strange celebration. To some, it’s their favorite holiday! Although it is not Strange Days, I am hoping that the Moto Jam project will be able to satisfy our Strange group in between. We would like to thank family, friends, and sponsors, but the biggest thanks are to all of the attendees. This event would not be what it is today without all of you." For more information about Strange Days and other events, keep an eye on their website, and follow them on Facebook and Instagram. The most recent Moto Jam project was the Hill Climb on October 28th, 2017. Expect a full feature heading your way soon. Kenny is gearing up for the 2018 season, and you can get involved through his website. 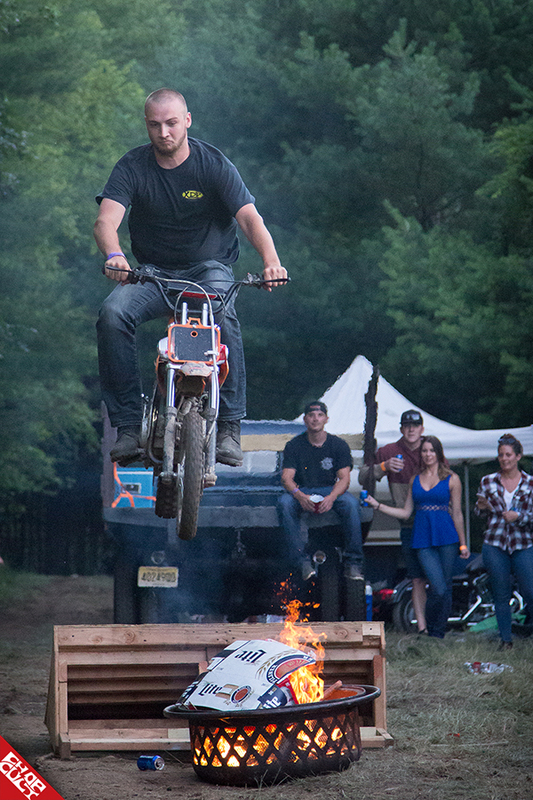 Be sure to give the Appalachian Moto Jam a follow on Facebook and Instagram. Huge thanks to Lisa and Chop Cult for the continued support, Daniel for the awesome coverage, and everyone that keeps coming out to this wild time!